His Beatitude Metropolitan Mefodiy, Primate of Kyiv and All Ukraine for the Ukrainian Autocephalous Orthodox Church (UAOC) Kyiv Patriarchate, issued an Edict from Kyiv making Bishop Paul Peter Jesep Director of Public Affairs for the UAOC-Kyiv Patriarchate in the United States. Bishop Paul Peter resides in New York. He is a lawyer, author and public policy analyst. According to the Edict signed and sealed by Metropolitan Mefodiy, "With this we authorize Your Excellency to represent the interest of the Ukrainian Autocephalous Orthodox Church to the mass media, government authorities and political institutions of the United States of America." 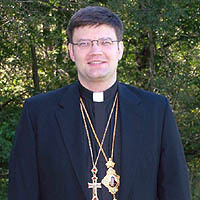 The appointment was made by His Beatitude in Ternopil while Bishop Paul Peter was in Ukraine this past April for Easter. At the time Bishop Paul Peter visited with His Beatitude both at the chancellery office and at his country residence. The signed document along with an identification card arrived in the United States late September. The UAOC-Kyiv Patriarchate is the third largest Orthodox Church in Ukraine and has played an important role in the nation's spiritual revival, national reawakening and move toward democracy.